My first born's first born was six months old the first time I met him. I was so excited. Every grandma can tell you how over the moon it is to see your baby's baby. The holidays will be a time when many babies meet their grandma and grandpa, and aunts and uncles for the first time - and many of them all at once. It can be very overwhelming and tiring time for the baby and mother, and father. I'm an attachment and birth therapist and I support babies in the womb, newborns, and infants and their mother and father to resolve issues of disconnect. In time for the holidays, I'd like to share the story of how I met my own grandson and to suggest ways that you might use to meet your grand babies and other children during the holidays or anytime. The newborn baby is communicating in the womb and immediately at birth. Toddlers who say no to kisses and hugs need to be honored and validated. Let me tell you why it going to help you in the long run to honor this. My grandson happened to be six months old, but if he were six hours old he would need the very same respect from me (and everyone) of his boundaries and protection of his need: Mama. And, I would do it the very same way – except that I, as prenatal and birth psychologist, knowing what I do about the critical time of attachment development for first forty days, I would not expect to hold the newborn, even my grandchild, unless it was needed. A newborn baby will “check out” when in arms of even grandmother if her energy is too much, if she is too needy, and what I share will help you to hold a baby being present with the baby. 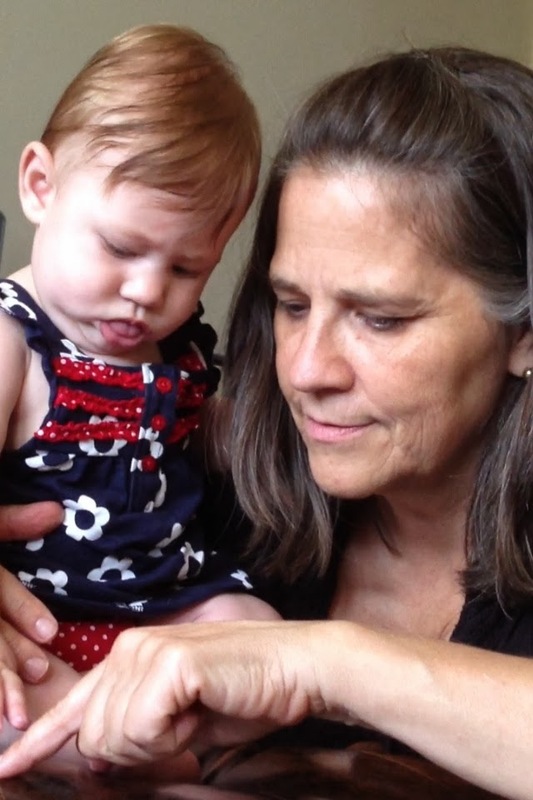 I am a craniosacral based therapist and I “work with” babies of any age; and, as a therapist, it is key that I only touch or hold babies who ask or grant me permission. EVEN the newborn baby is capable of responding as I describe here. If you try what I suggest here, with your grandchild, friend's babies, or even offering your baby to be held by other, and if you watch the newborn baby, you will see it: the baby's "no". A newborn baby will communicate clearly with body and facial language to others: “No." "Don't touch me." "Get out of my face” or space. And, yes, oh yes, there IS a special undeniable connection between grandmothers and grand babies, and grandmothers should engage with their grand babies. It is wired in us and we grandmothers are meant to serve an important role. A critical, vital role. That is why is important to not create disruption for the mama-baby but to build trust. We women just need to learn how to do this honoring of mother-baby-grandmother again. Grandmothers, in relationship with father, and in their absence, were always - and we still have instinct to be - the protectors and the keepers of the sacred mama-baby bond. In the fifteen year journey of healing the disconnect with my newborn son (he was 25 when I started!) I've learned what he and I needed is what I can give his son and mother. I have chosen to break the cycle of mama-baby disruption. I would not want to be pregnant and have me as a mother-in-law, I more than half-joked. I suggested, and we agreed, that I would share whatever I wanted with my son and he would pass along what he thought was appropriate. I was already so aware of the confabulation of emotions and needs of my own (from traumatic birthing of my son) and how it intersected with their rights to their decisions and plans. When my daughter-in-law and Jackson were in labor 800 miles away there was nothing to but go to bed at midnight. Later I startled awake, sneezing about six times and so loudly that I woke my daughter. I coughed and coughed. I looked at the clock as I was so accustomed to since my other son was deployed. 2:48 am. I knew my son's son was here. At six a.m. my son texted that the baby was born about 2:45 a.m. and everybody was good. I later learned he had been suctioned, a fear of mine since my whole film emerged around my daughter's son rough, unnecessary suctioning. Oh, yeah, we are connected. Six months later I was finally going to meet my grandson. Whooohoooo!! Everything in me wanted to squeal with delight and grab him ... like Grandmothers often do, because we are madly in love already, and because our babies were grabbed from us. I was upstairs when my son, his wife and new baby arrived at my daughter’s house. My new grandson met his two aunts, two cousins, age three and 10, and his uncle before I came down. I waited a few minutes for them to all settle. 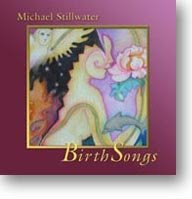 I did what I do working with babies, that I've learned is a way of being present with: I managed my own nervous system. 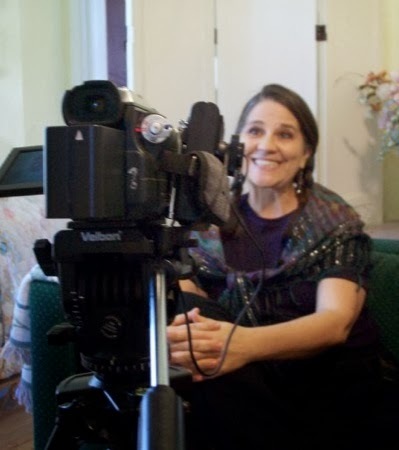 (you can see this in the Chapter 10 excerpt in my film - Healing the relationship after traumatic birth), me with working with babies to support the mama-baby attachment. I came downstairs and into the family room where my son was holding his son. They were about twelve feet away from me. My son excitedly said, “Jackson!! here’s your Graannny!” I had stopped in the doorway and Jackson turned to me. He had a look of recognition, a little gasp and a smile. Then he did what babies (newborns) will do. He looked at his dad. Babies seek security with eye contact with their caregiver. I lowered my eyes, looking away so that Jackson could check me out. This is what babies need. 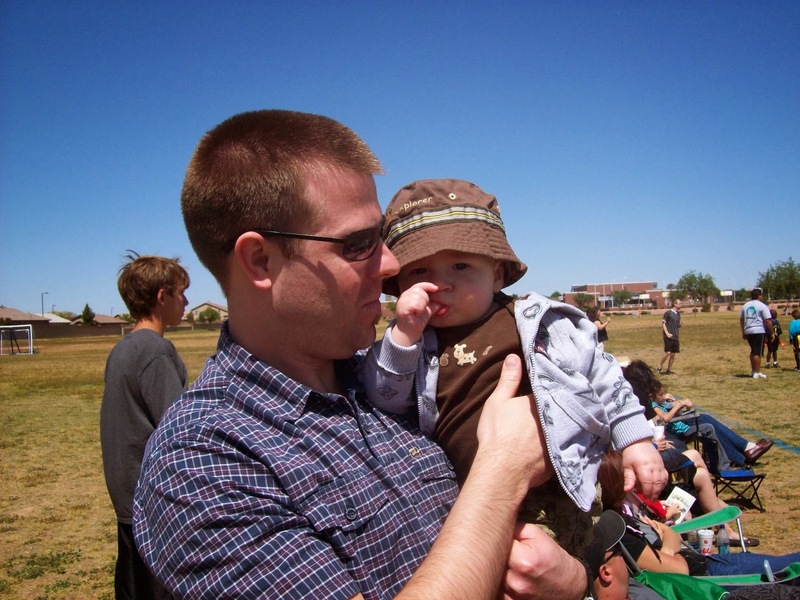 Babies are overwhelmed by adult energy and eye contact, and adult's emotional expectations. Jackson looked back, shyly. I said, “Hi, Jackson.” As I looked away. I slowly moved closer looking at him briefly and looking away to allow him to see me. Babies can not handle too much adult energy and eye contact. (Babies learn early to accommodate adults but that is not right.) At one point about six feet away his comfort level changed. He was no longer excited. His breath changed. He kept his gaze with his dad, and he “hunkered” in against his dad. This is communication. It is so subtle, yet so obvious when one realizes it. I stopped and I said, “Oh, I’m too close. I’m sorry.” I stepped back. Checking in with him first, and then looking away. This whole thing was only a minute or two in duration. When Jackson’s body relaxed and he smiled, I moved closer again and he was comfortable with me. When I was a few feet away I did not touch him. I never, ever touch babies without their permission - unless to keep the child from harm - even when mothers ask me to. His dad was so excited to introduce his son and mom. "Well, yeah," I laughed. We had determined that years ago. We sort of grew up together. He was born when I was still 18. I'm not the eighteen year-old mother to whom he was born. I am the evolving mom, woman, and grandmother my son has helped raise and inspired. I'm known as the Baby Whisperer, the Baby Keeper, and even Baby Lorax now. I just listen to babies. Honoring my son's son and his mama is part of me healing with my son. I “moved my attention” from Jackson, telling him that I was doing so - because babies his age are hurt by our attention that just disappears (often when adult has met their own needs and moves on). I turned my attention onto my collective family. That was all Jackson was ready for and I respected his needs. We had a family brunch and during that time as I engaged with my other two grandsons, and with my family, I would catch Jackson watching me with interest. I would smile at him. Then I would look away and let him watch me, so he was comfortable. Yes! It is almost like flirting. After brunch we went to my older grandson’s football game. By then it has been two or 3 hours. At some point during the game, I was standing by my son who was holding Jackson, and we were just chatting. I felt Jackson’s foot and I looked down and then at his face. He showed me a teasing smile. He reached out with his foot and poked at me again. Touching us is one of the ways that babies let us know that it's ok for us to touch them. It is very often with their foot. Engaging us with eye contact and vocalization is another. A newborn has the capacity to do this - will look at you and even reach to you. A newborn has the ability to say no. A newborn will look away, or checkout and appear to be sleeping. It is instinctual to seek connection with the mother and to check out when in arms of others. So, there is no reason for anyone who is not a primary or secondary caregiver to hold a newborn except to support and provide love and comfort. The baby can be admired in the mother's arms, and believe me, the baby is feeling and sensing and hearing your presence, so the most respectful way is to open your heart, honor the mama-baby, and speak softly, introducing yourself, and decline holding baby, even if it may hurt the mother. Send her this article. It was my intention, above my excitement as a grandma, to be respectful of his boundaries and needs from our first moment, and to honor his need for his mama. I held him for awhile ... maybe ten minutes. I continued to follow his lead and not expect him to respond in a way to make me feel okay, or fulfilled. 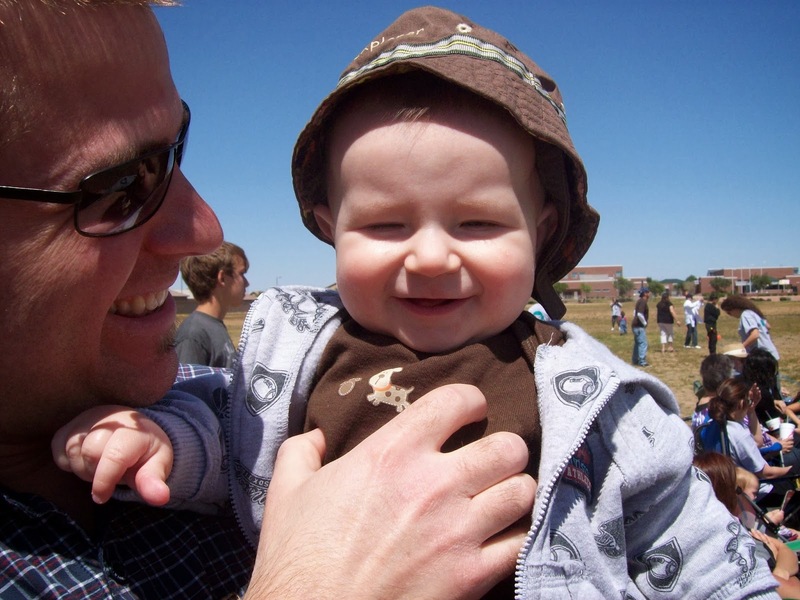 Adults often need babies to smile or respond to feel fulfilled: "The baby likes me if I can get baby to laugh or make eye contact," and most often the adult overwhelms and intimidates the baby, and can even feel - andbe - disliked by the baby. I once witnessed a older man in restaurant make a huge effort to get my friend's 16 month old son to engage and respond. The boy didn't want to. After three or 4 attempts by the man, I saw this boy give the man a fake response. Immediately, the man turned his attention and left. How rude! It happens all the time. His mother knew how to support him. That is a key take away here. How to protect your child from anyone and how to repair it when people don't know how to be with a baby. When an adult does this or says to child, "Gimme me a hug", this is a huge signal that the adult is expecting the child to take care of their emotional need. If they demand it or expect the mother or father to force it, they are very wrong. When the adult says that, or feels hurt that a child doesn't want to be held or near them, the ADULT needs to STOP-DROP-AND-ROLL ... because they are on big emotional fire. "May I give you a hug?" is about seeing and attending to the baby. "Give Grandma a hug" is about Grandma's needs. The adult needs to STOP. Take a pause and a breath. DROP into their own emotional state and own it. Ask, "Why do I need this child who needs only his or her mother?" Settle their own nervous system. Breathe, feel their own emotions and claim them. Decide to do what is needed to heal one's own needs. And, ROLL. Decide to honor the child. Observe. Roll with the child's needs. Put child's needs before your hurt feelings. Follow the child's communication – body cues. We need to learn to do this because babies DO want to engage with us; however, children are not meant to resolve or take care of adult's needs - to put out their emotional fire and fix what broke them. What we do, so children learn. So children do learn to interact in this boundary violating way. It is "what's wrong with the world" - boundary wounding. And we must remember that they are learning from their interactions with us. STOP-DROP-AND-ROLL. It's a quick way to learn to be attuned to the other person, newborn to elder. Because I intended to be attuned to Jackson and I wanted to support him to feel secure, I felt him become uncomfortable after ten minutes. TEN MINUTES!? In six months!? I am the Grandmother, after all!! SO WHAT!? I'm the adult. He is the baby. HE NEEDS his mama. He'd had enough time away from his mama. Had enough of me. Seriously, folks, when you just have to hold that baby, believe me, it's very unlikely that the baby wants you and it means you are on emotional fire. Nature programmed us to want mama. I felt/saw my daughter-in-law's unease too and her wanting him. I felt/saw he wanted to nurse and I said to her, “He is becoming uneasy and wants you. I think he wants to eat.” (what his dad calls breast feeding! and I said it only to validate her.) She said she was about to say that he wanted to eat. He might actually just need the breast to reconnect with her. She was so relieved - she didn't want to have to fight her instincts for her child vs her mother-in-law's on-fire emotional needs. Many people in the generation who are grandparents now were not breastfeed and did not breastfed their children. Women were taught to feed baby every four hours, to let baby cry it out, and that it was better for baby to be in institutionalized care of others so she could focus on financial equality. THIS, my friend, is a source of FIRE for everyone, especially grandmas. It takes so little to ignite that flame into a runaway fire. So many times grandparents feel this "constant breastfeeding" is an “excuse” by their daughter or daughter-in-law to “not let them hold the baby.” Sometimes it may be, that a mother does not want even her family member to hold the baby. That's nature. Don't make mama feel guilty for doing what is right. But the truth is that babies need to nurse on demand, frequently. The truth is - eons of doing it and now research confirming it - that mama is "home base" and where babies feel safe. This is especially true in gatherings. They feel safe because the mother's body - her heart and nervous system - are still assisting baby to self-regulate and to adjust to the world. Breast = safety. The truth is that babies need their mothers, and nature has provided for her to provide that. This new (but old) way of caregiving is not the way most grandparents learned and believe is "normal." So, unfortunately, many times it is true that the mother does not want people who have overridden her boundaries her entire life to do so to her baby. Forty years of science has confirmed what we know: Babies are programmed by nature to attach to a primary caretaker. They are meant to be exclusively in their mother’s arms through the first nine to 12 months of age. This is now known to be the “last trimester” where important brain development around secure attachment needs to happen - for us to be optimal humans. 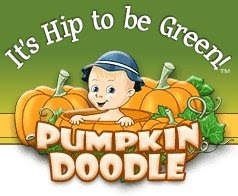 I am sorry that many of you did not get this as a baby nor knew to do it. THAT is on society. Babies really do not want or need to be held by anyone but people who will be primary and secondary caregivers. Grandmothers were meant to be secondary caregivers, so the engagement of the grandmother early on, in a way that promotes and secure mama-baby attachment is vital. But she can not be on emotional fire. If you are meeting a new grandchild, a new niece or nephew, please try the process I shared here to meet your new family member. ANYTIME you are with another person's baby, child or even teen, STOP-DROP-AND-ROLL. Don't project your stuff. Don't violate their boundary. This is critically important for the newborn and mother relationship; and, your support now will pay off in big ways later if are you in baby's inner circle. In the long run, if you use the process and you respect the baby's boundaries, if you regulate your own adult emotions, and if you respect the energy of eye contact, then the relationship you foster with your baby family member will be one of great trust of you. When it is time for the child to expand his or her circle, you will be the secure and trusted ring around him or her. You will be a safe person in their world. Nothing could be more important. Several hours after we met. We met over the huge ottoman. I've lived 1000 miles away until a few months ago, since I wrote this in November. I have seen Jackson and Elise on Thanksgiving and Christmas and a couple of times a month. Last week when Elise knew I was coming, she did a "Graaaannnny is coooomiiinnng" dance. Upon my arrival, she did an adorable dance around the room. Even though my heart may be popping, I still wait until she comes to me. I don't grab her. Maybe your grandchild or niece comes running to you. Awesome. The point is for you the adult to moderate yourself, in relationship to the child and respond to the child's communication to you. Child communication is often behavioral, non-verbal. When they do begin to speak we need to honor them. While I was there last week I sat by Elise as she was watching a video on a Kindle. She was not eating the blueberries in a bowl between us. I asked, "May I have a blueberry?" She looked at me, then the berries, and then eye to eye again. She said firmly, "NO." I smiled and said, "Ok." She went back to her video. Yes, she IS almost two!! It thrills me to honor her "no" and her boundaries, and "let her" have "the power." It saddens me that there was a time, with my own children, and I see it all the time, that adults, in this situation, will feel threatened or upset, and then tease, making a game of seeing the child's responses of being upset. Laugh at their response to be teased and their no overridden: "Ooooh, I'm gonna take one!" or with pouty face, "Why can't I have one? Don't you wanna share with me?" "Grandma can't have one of your berries? You are so mean. Grandma is gonna cry," while enjoying seeing the children's painful reactions. You are on fire. You are teaching the child passive-aggressive behavior. It's actually teaching bullying. Or the adult will chastise the child, making child feel guilty, or force the child to share. Or guilt their adult children to make the child comply. Please, please do not do this. You are on emotional fire when you do. Your own childhood is the fuel source. Stop-Drop-and-Roll. REGULATE YOURSELF, and remember that your goal and purpose as grandmother or friend or stranger is to support, nurture, and protect a young child who is learning from you. Follow the baby or child's cues. I call this "being present with" and it is a way of being with present with anyone of any age or relationship. We must, especially as mothers and fathers, grandmothers and grandfathers, and others, think about how WE wanted and needed to be treated as a baby, toddler, and child or teen. If you can't, then just think about how you want to be treated today. That is what a baby and child wants and needs; not how we were treated. "My DEAR friend ("The Babykeeper") has such important things to say about meeting the new baby. I have kept this in my heart & mind since she first clued me in. I cannot count the number of times a parent has thrust a baby into my (or others) arms when they clearly weren't ready. This just happened at a park. I asked the baby's permission and waited to receive it - everyone thought I was weird; but when the strangers baby was ready for me, we had the most amazing interaction. I am a HUGE BELIEVER in respecting the baby." Nicole: Thank you for all you do for our voiceless little beings L Janel! You are changing the world! L Janel: With your help! How have you noticed your interactions with child and adults since seeing the sentience of babies and honoring their only need - to be near mama? Nicole: I have changed beyond measure because of you! In the past, I'd be the first to scoop that baby (love) right up. Not any more. Having their permission is SOOOO worth the wait. Another day at the park had me feeling so sad and protective. There's a mom (who you have heard me talk about) that takes anyone's baby right out of their arms if they don't know how to say no. She just did it a few days ago, and the little guy clearly didn't want to be with her - his body language was CLEAR! There really wasn't much I could do -- except, get close enough and talk to him, "oh little guy, you want to be with mommy, I hear you. I'm sorry no one is listening to you! I am, and I'm sorry." He always catches my eye and gives me the sweetest little look. He (and several other babies) have the same reactions to me vs the baby-mojo-stealer. She is so clueless AND selfish, I'm hoping she will eventually pick up on the message I'm trying to convey. You know I am outspoken, but sometimes, I know saying something so direct will make things worse so I'm trying to set an example. At least the babies feel my respect for them; I hope it's enough to help. L Janel: It's ok to speak on behalf of the baby -- and talk to her about it. When we realize it is for the baby and the mother would want to know .... And you nailed it .. right on about how to talk to baby. 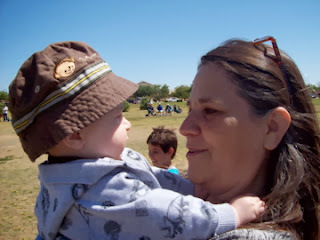 Nicole: Janel, here is an interesting part of one of the baby interactions I wanted to share: we were at a park in Santa Cruz and I was sitting next to and having a lovely chat with the baby girl's mom (as our boys played). The mom did offer to let me hold the baby, and I asked the baby if I could hold her and her body language was clear, "NO!" I didn't push it, and i did not take it personally. I am a stranger, she wanted to stay comfy in mommy's arms. She was only 4 months old. About 30 minutes of sitting and chatting and also acknowledging baby calmly, her mom tried putting her in my arms and I said, "i don't think she wants to, it's ok, let's respect her wishes". Her big brother, Cole's age (5) came over, and took the baby into HIS arms and we both spoke lovingly to her. Her entire demeanor changed, and her "big" brother looked at me and said, "she's ready now, do you want to hold her now?" It was amazingly intuitive of this little boy. I was so impressed with him. He handed me the little baby girl, and she relaxed immediately in my arms. It was a beautiful moment for all. Ok, i will admit, when they handed me the baby bottle to feed her i had an incredible urge to want to nurse her LMAO!!! I haven't fed a bottle to a baby in i-don't-know-when and it was strange. But we figured it out. She cuddled and snuggled more and more INTO me and fell asleep. YOU would have been proud. Janel: I am so proud ... you know it ... oh my gosh.. you are so amazing. Such an amazing story all around with big brother. My heart is so full ..
And once you start seeing this a whole new world opens up and you see that these souls are so there. a lovely article that I can really relate to. I took part in a project called babywatching with my 1month old until he was almost a year to help with attachment in children. They were never allowed to touch him, but on the last session they all wanted to say a 'proper goodbye' which to them meant being able to hug and cuddle him. So we had a different session. They were still not allowed to do anything to him, but just sat on the floor and we waited, he moved from me and back to me various times, but by the end of the session all children (around 30) and had cuddles, kisses and been climbed all over. they thought it was wonderful and Tim was completely relaxed with the whole process. Thank you for sharing your wisdom. Your article filled me with hope. 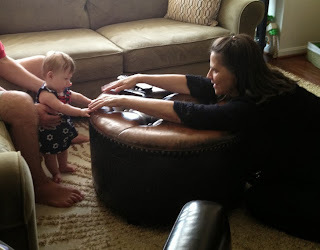 This is the most amazing article on interaction with Babies. My four year daughter was so scared to see strangers as a Baby that we almost stopped meeting friends. At times, because other babies were so chilled out and mingled easily, we thought it was her extreme reaction. At times we would try to get her going to our friends. But then of course, she never did that and till now, at four, she doesn;t mingle too easily. Although thats changing now due to her schooling. Reading your article I felt I was so horrible to have thought of my baby as non-mingling...while the reality is that they do it as their own ease n pace! Of course there are many more things that I could not go so correct with, as it was first time for me too.... but yes, we as adults have no excuse, whatsoever. Also, I think what you said about the passive-aggressive behavior is quite right...we forget that by saying, 'Oh, I'm having, but you're not' kind of things, we do arouse a passive negative feeling... may be that shows up when they grow up. Thank you so much for sharing your journey with your little one. It speaks to how different we all really are from the beginning. And about her insistence on communicating her needs and preference. Makes me wonder how many of those babies you felt to compare your daughter to are actually babies who had to adjust and for whom there will be consequences if their needs ignored and boundaries violated. What we are taught is "normal" in our society is not. You also remind me of the power of healing. All is not lost when we learn what we didn't know. At any time... if you were sixty and your daughter was 40 when you read this and felt the, "Oh, my gosh, didn't know" and you feel it in your own body, and you feel the I am sorry,, you have begun to heal it. Your baby feels it. We are that connected. A Grandma or aunt ..whoever.. who has overstepped babies boundaries reading this who gets it... feels it and in their heart acknowledges it and says I am sorry will shift their relationship. Thank you for taking time to let me know. That touches me deeply. Blessed be. That sounds like an amazing program. Thank you for sharing that info with me and others. Your respect for and understanding of babies is beautiful. Thanks for this post. Thank you so much for this!! I want to give it to every new mom, grandma, friend of a new mom, etc. This is similar to what I've tried expressing to my in-laws, but they are from the generation that takes it deep as a personal attack rather than me trying to honor my children. I am so grateful there are people out in the world that not only *get* this, but advocate for it. Thank you so much!